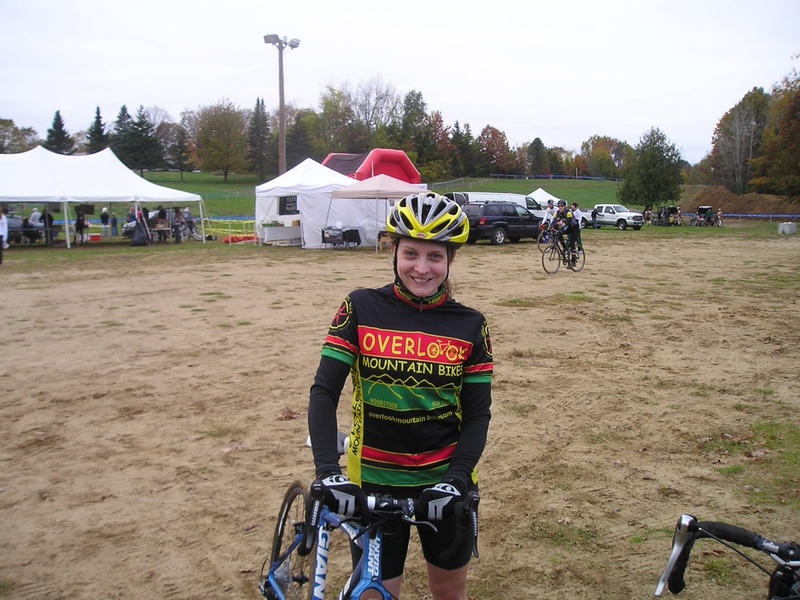 I am not sure what I was getting myself into signing up for a cyclocross race after having had very little time to practice, or attempt to practice, as in my prior post about the sport. The race was in Saratoga, very close to the famous race tracks, which I realized after 1. passing a sign indicating it was home of the Saratoga Springs race track and 2. why there were so many horses everywhere. 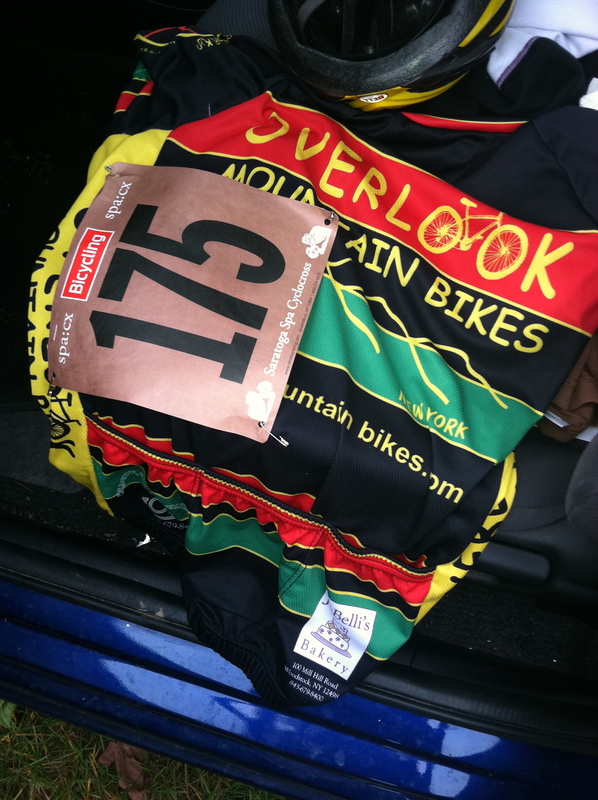 The experience, as a whole was fun, and I cannot remember the last time I raced just for fun. Really, all races should just be fun anyways, right? My innate poor sense of direction made it slightly difficult finding the race as normal– perhaps if I had a navigation system things would have been slightly easier. But even with a printed out mapquest directions, I still got lost a couple of times (okay, a few illegal U Turns were made as I was passing the bridge going into Massachusetts, which is definitely not where I wanted to be.) And, it gave me directions which made no sense to me. Then again, it really wouldn’t be a true racing experience if I did not get lost trying to find the place. I did make it in time to get my number and meet a couple new friends and did a couple of practice loops on the course which consisted of a run up, a couple little hurdle/obstacles, and a long sand pit, which the really good racers could just plow through on their bikes. I, on the other hand, attempted to ride through which was unsuccessful, and probably wasted more time, hence simply carried the bike and ran through the sand. (Hey, people carried their bikes in the YouTube videos I studied). One of the hurdles--those are what they are called, right? And no, I was able to stop before and jump over with my bike and not fall into it. I was with the cat 4 women and it was the first time I’ve ever actually been in a group of cyclists all starting at once, which was a little nerve wrecking being so close to other cyclists.But, a quick “good luck and have fun!” from Billy D. as I was waiting at the start definitely helped ease the nerves a bit. 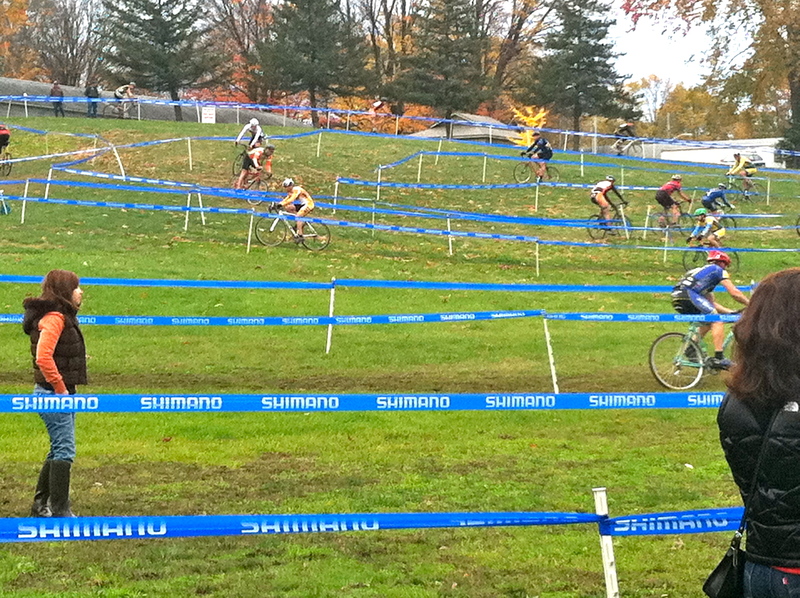 Throughout the race, you are in close proximity to the other racers for the first lap or so (depending on category determines how many loops you do in the allocated time.) Falls can occur, and often do, with a course that has sharp turns, or areas where you have to ride through thick mud, and if you cannot brake in time to avoid collision with the cyclist in front of you. Cat 3/4 men on the course--they are good. Basically, it’s a sprint from the very start. You start fast, run up the hills fast, bike down hills fast, carry your bike fast, run over the hurdles fast, if your shoe falls off, put that on really fast too(no judging, I’m still getting used to my pedals).The course zig zags and marked by tape. Your lungs are on fire the whole time and your thighs burn. Like running a 5k or short sprint race. 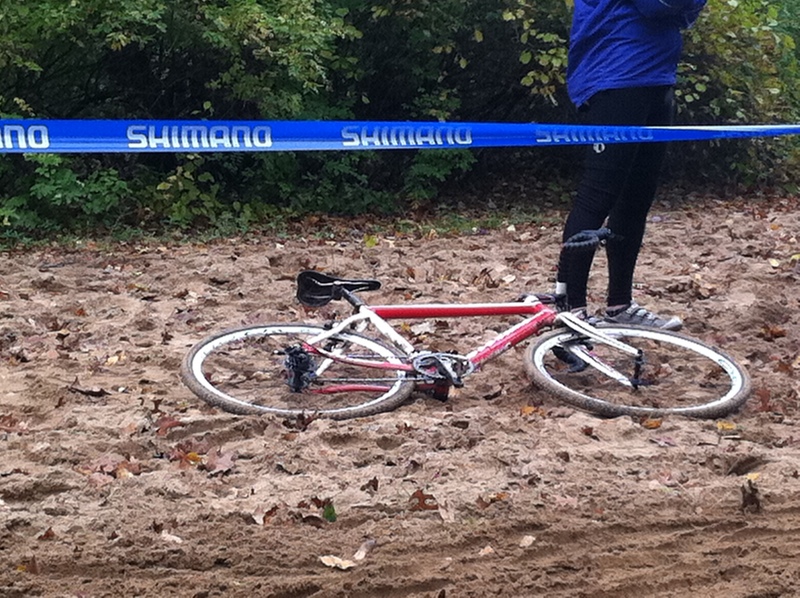 Bike handling skills, like in mountain bike racing, are of vital importance in a cyclocross race. You need to be able to control, or attempt to have control over your bike, because the course has sharp turns and “obstacles” and people cycling past you. My mountain bike handling skills are better–my best is road skills, probably because you rarely have sharp turns except for when riding in a town. Mixed with cheering is the sound of cowbells. I think I heard a cowbell once when I ran the Boston marathon. Perhaps there have been cowbells in other races too and I just don’t remember them. 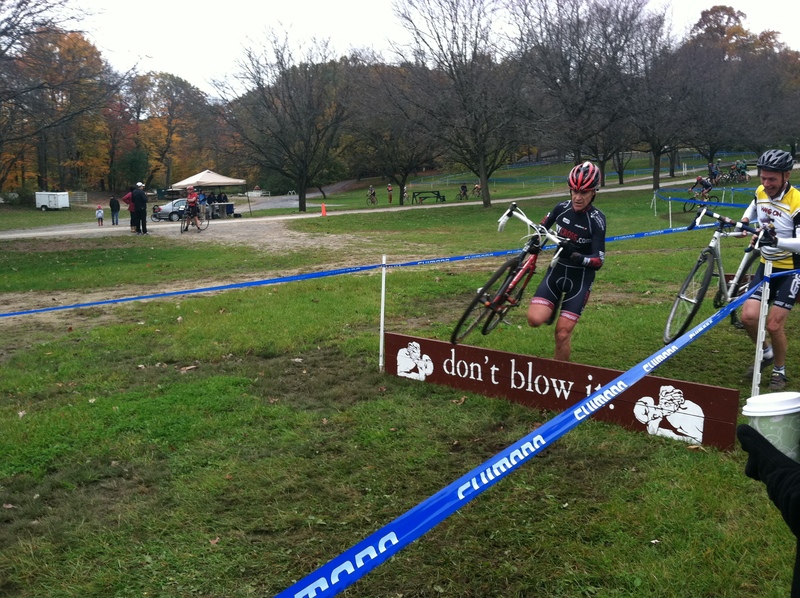 And, apparently, there is heckling which can go on during these types of races. I didn’t hear any. 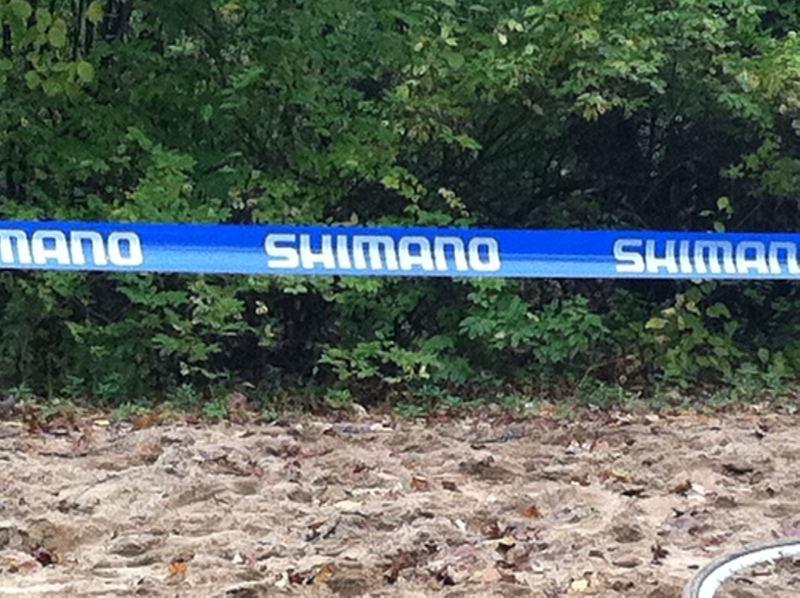 I thought that was just a mountain bike thing you do. But, apparently it isn’t. 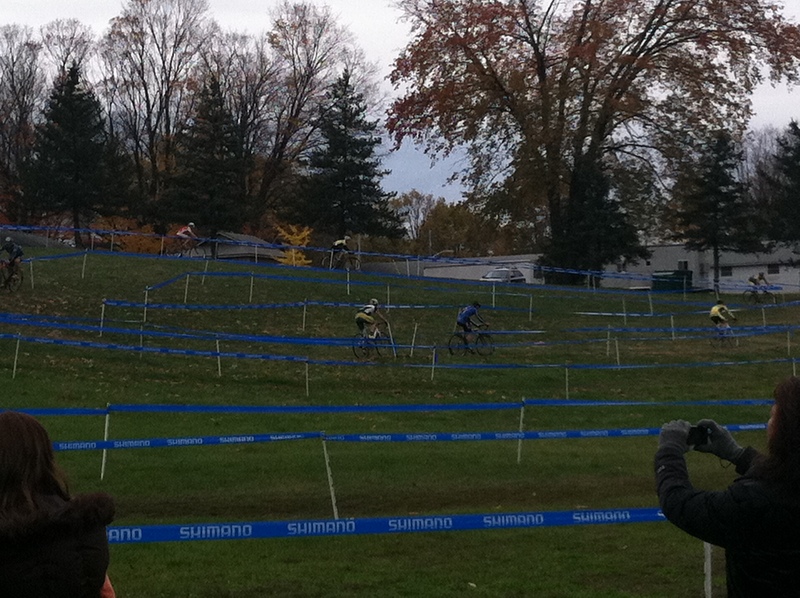 To sum up the first cyclocross race, I must say it was wicked fun, and tough. And to show that I raced, I noticed after getting home before taking a shower that I have nasty bruises ALL over my thighs and inner thigh (from the “mounting” and a nasty one on my right shoulder from flinging my bike over my shoulder when running through the sand…) .And that is the reason why I didn’t go to the pool today, in fear of someone saying, “what happened to you?” I think I just bruise easily. 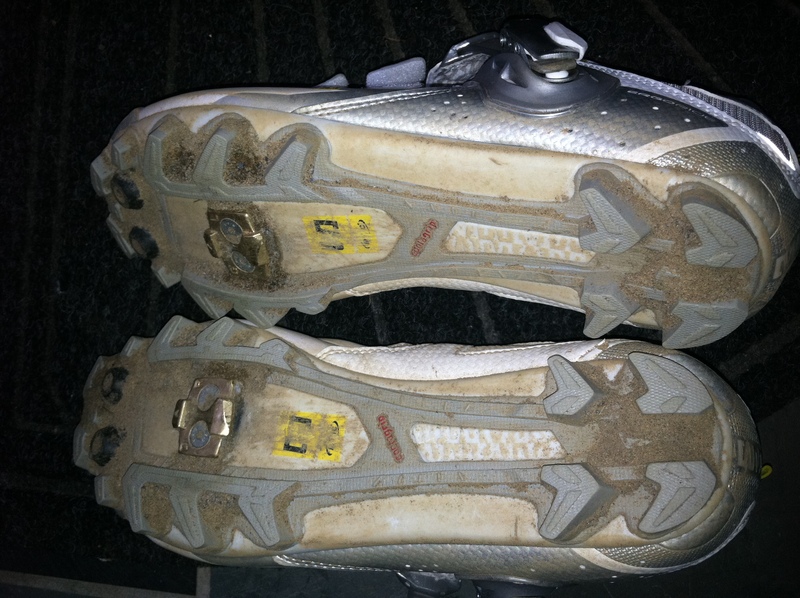 My new Mavics broken in! 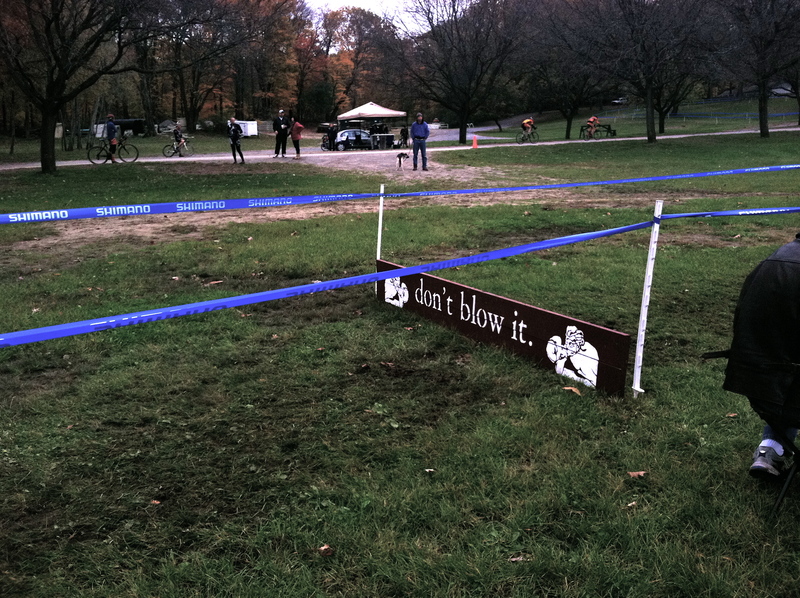 Thank you, NYCROSS for putting it on, and for the words of encouragement from others, and Overlook Mountain Bikes for getting me a sweet cyclocross bike to use. And the quick words of encouragement! Video courtesy of Mississippi Queen, has some shots of some of the Overlook team cat 3/4 men!And, the cow bells! Ohh, and I didn’t get lost going home!Sweet!